Final Fantasy V (ファイナルファンタジーV, Fainaru Fantajī V?) is a medieval-fantasy RPG developed and published by Square (now Square Enix) in 1992 as a part of the Final Fantasy series. The game first appeared only in Japan on Nintendo's Super Famicom (known internationally as the Super NES). It has been ported with minor differences to Sony's PlayStation and Nintendo's Game Boy Advance. An original video animation produced in 1994 called Final Fantasy: Legend of the Crystals serves as a sequel to the events depicted in the game. It was released for the PlayStation Network on April 6, 2011 in Japan. An enhanced port of the game, with new high resolution graphics and touch-based interface, was released for iPhone and iPad on March 28, 2013 with Android released on September 25, 2013. It should be noted that Final Fantasy V has undergone five English versions with three attempts at transcription. First, each version was apparently translated from the Japanese independently of the others; the Super FamiCom (SNES) version by a group known as RPGe, the PlayStation version by Electronic Arts in partnership with Squaresoft USA, and all subsequent releases by the combined Square Enix. The result is that dialogue scripts, place names, item names, enemy names, and character names differ from version to version. For dialogue sequences, the wording is different but the gist is pretty much the same. In most cases, names are either identical, for example Excalibur (SNES) = Excalibur (PS1) = Excalibur (GBA), or can be chalked up to limitations in Japanese orthography and variations in English spelling, for example Gala Cat (SNES) = Ghilacat (PS1) = Gaelicat (GBA). In some cases though, the translations are very different, for example Garkimasra (SNES) = Harpy (PS1) = Jackanapes (GBA). One confusing difference is that Potion (SNES & GBA) = Tonic (PS1) while Potion (PS1) = Hi-Potion (SNES & GBA). 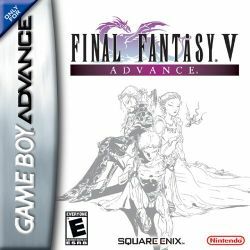 The mobile versions released for Android and iOS essentially take their cues from the GBA version, but the controls are optimized for the touchscreens of these devices. The in-game dialogue and character names appear to be faithful to the original Japanese script. These versions also add enhanced character renders in dialogue sequences, based on the original artwork of Yoshitaka Amano (e.g. Lenna's avatar has blonde hair in dialogue, though her sprite's hair remains pink). You can also save your recent data to a corresponding cloud account (Apple or Google) and transfer it to other devices on the same platform, a mobile exclusive. This page was last edited on 13 February 2019, at 22:58. This page has been accessed 97,338 times.